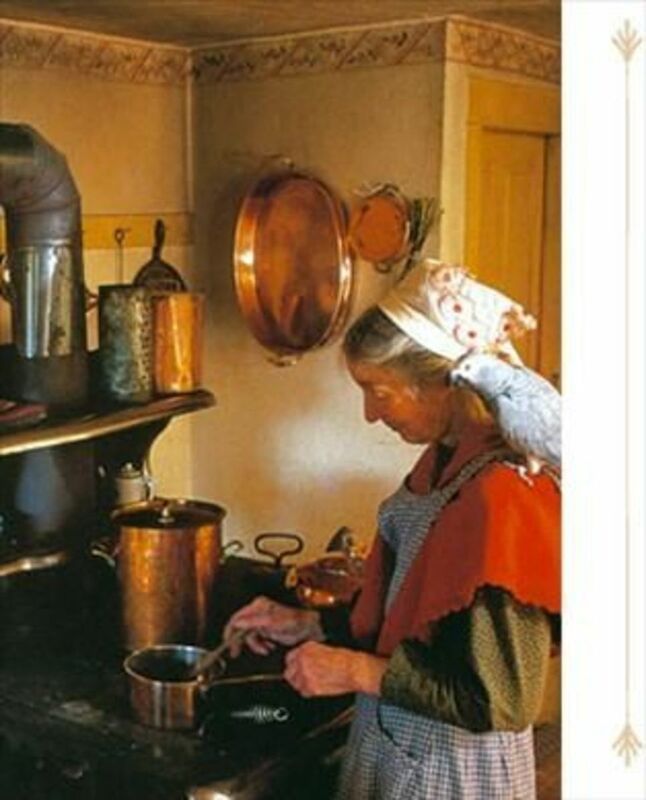 It seems that Tasha Tudor has always known exactly how she wanted to live. From the time she was a little girl, she dreamed of living on a secluded farm where she could surround herself with a garden and a slew of household pets and barnyard animals. She also knew that she wanted to illustrate children’s books. Today she can look back on her life with satisfaction that she has fulfilled both of her dreams. 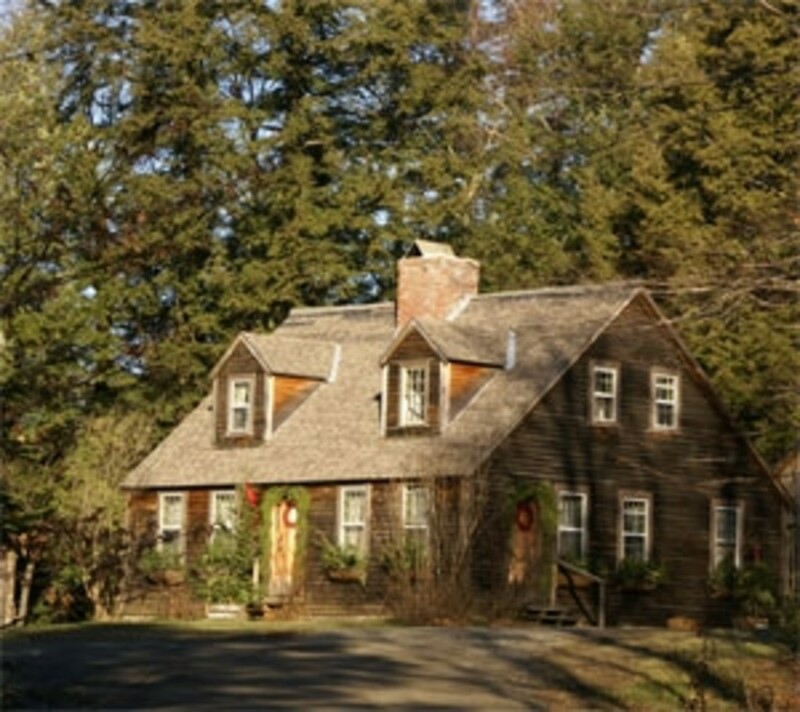 Tasha has lived most of her life in the New England countryside and currently lives in a setting of her own creation in rural Vermont, reminiscent of an earlier time. 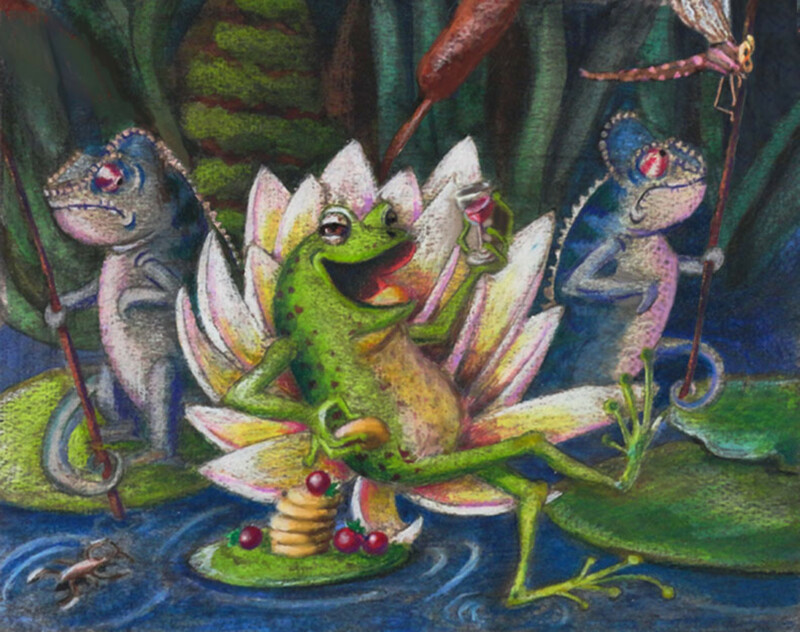 Tasha is also a much-celebrated illustrator, and has illustrated nearly one hundred books. 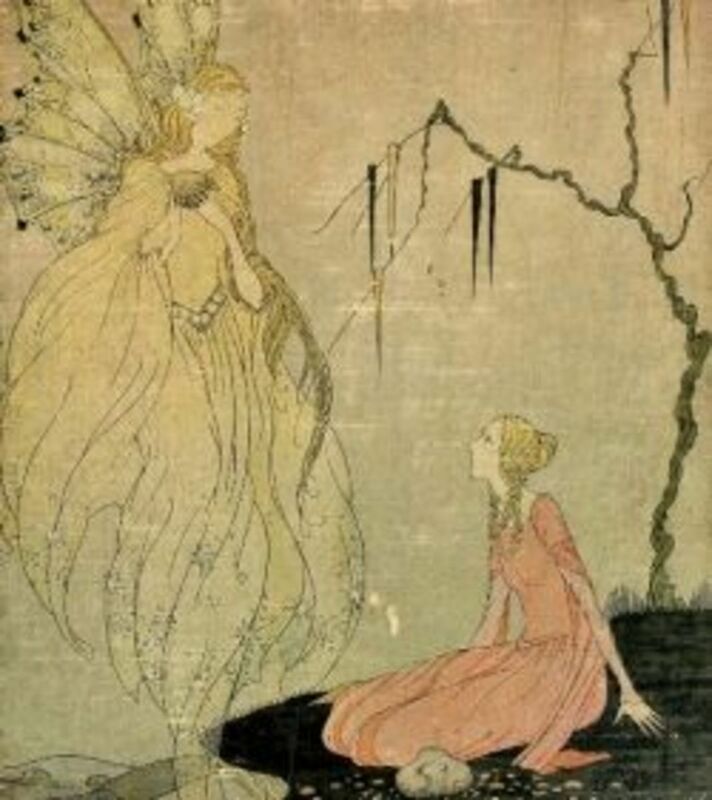 Among her most famous illustrations are for the books Mother Goose, The Secret Garden, The Little Princess, Little Women, and The Winds in the Willows. In her mid-80’s, Tasha Tudor has emerged as a lifestyle icon. She has spent her life cultivating a world of her own making. Tudor’s illustrative style is self-taught and is a direct reflection of her own lifestyle and interest in the early 1800’s. She lives a simple lifestyle reminiscent of the 1830’s, spinning and weaving flax into cloth, sewing her own old-fashioned long dresses, cooking on a wood-burning stove, milking goats and hand-dipping candles to light her rooms. She spends hours working barefoot in both her vegetable and flower gardens and peacefully working on illustrations for current projects. Tasha’s art is a world of beauty and imagination. It also has an old-fashioned charm. The scenes she paints are mostly of happy family outings, animals, sunshine, laughter, simplicity and peace, depicting a way of life many yearn for but few achieve. People seem to be drawn to the sense of innocence and nostalgia depicted in her work. But for Tasha, the scenes she paints represent her reality. She paints what she sees every day - her house, her garden, animals, children, and friends. 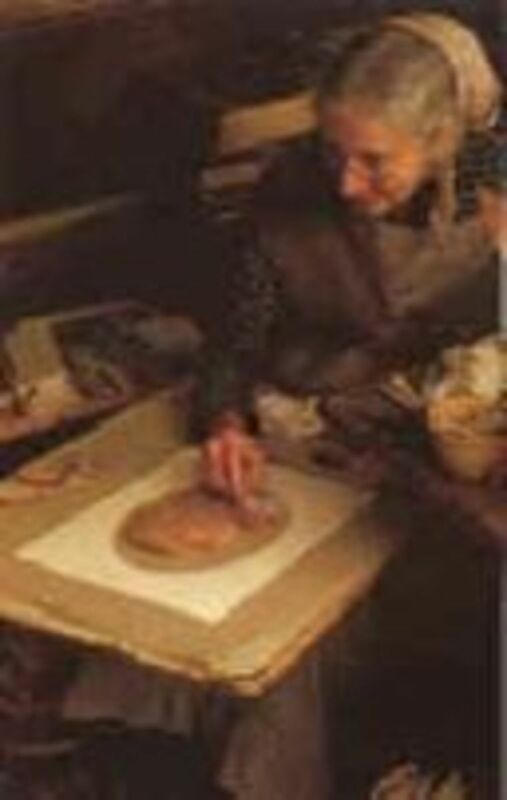 It is not just her work as an author and illustrator that makes Tasha Tudor a remarkable woman. Tasha is a noteworthy woman because in this world of mass-produced, Hollywood values, she has had the courage to create her own world and live out her dreams. Tasha was born Starling Burgess on August 28, 1915 in Boston Massachusetts. Her father was William Starling Burgess, a noted yacht designer and enthusiastic sailor. Her mother, Rosamond Tudor, was an accomplished portrait painter who always used her maiden name professionally. It was Mrs. Burgess who chose to name her after her father’s family, but her father did not care for it. He favored the name Natasha, from Tolstoy’s War and Peace, and the name stuck. Eventually it was shortened to Tasha. Both William and Rosamond were nonconformists in many ways. William was a master storyteller and was given to impromptu performances and Rosamond generally favored the Bohemian life of an artist. While they were individualistic, they also had impeccable manners and social graces. Tasha is much like her parents in these respects. While she has chosen to live by her own standards rather than those imposed by society, she has the manners and graces of the genteel. She attended the Boston Museum School of Fine Arts and later continued her training under several prominent artists. From the time she was born and through a good portion of her childhood, Tasha had a beloved Scotch nanny, Mary D. Burnett, whom she called Dady. Dady was like a second mother to her and Tasha adored her. Dady kept in close contact with Tasha even after she was grown. Being a very domestic woman, Dady helped Tasha learn the art of homemaking with lessons in cooking, sewing, and housekeeping at a very early age. Tasha’s parents divorced when she was only nine years old. Her mother took her with her to live in Greenwich Village in New York City, so Rosamond could work seriously on her painting. But, while Greenwich Village was then a popular place for many important writers and artists that came there to live the Bohemian life, it was not a good place to raise a child. Because of this, Tasha was sent to live with family friends in Redding, Connecticut, visiting her mother on many weekends. According to Tasha, living with Aunt Gwen and her daughter Rose, though unconventional, was one of the best things that ever happened to her. Aunt Gwen was an aspiring playwright and was too wrapped up in writing plays to spend much time cooking and housekeeping. She often read out loud to the girls far into the night and encouraged them to use their imagination by acting out characters from the books that she read to them. Tasha and Rose, became close friends along with three other girls that lived nearby. They spent much of their time roaming the countryside and were free from formal discipline. Nothing was ever on schedule at Gwen’s house, except on the weekend when Rose’s father, Michael, came home from his job in the city. 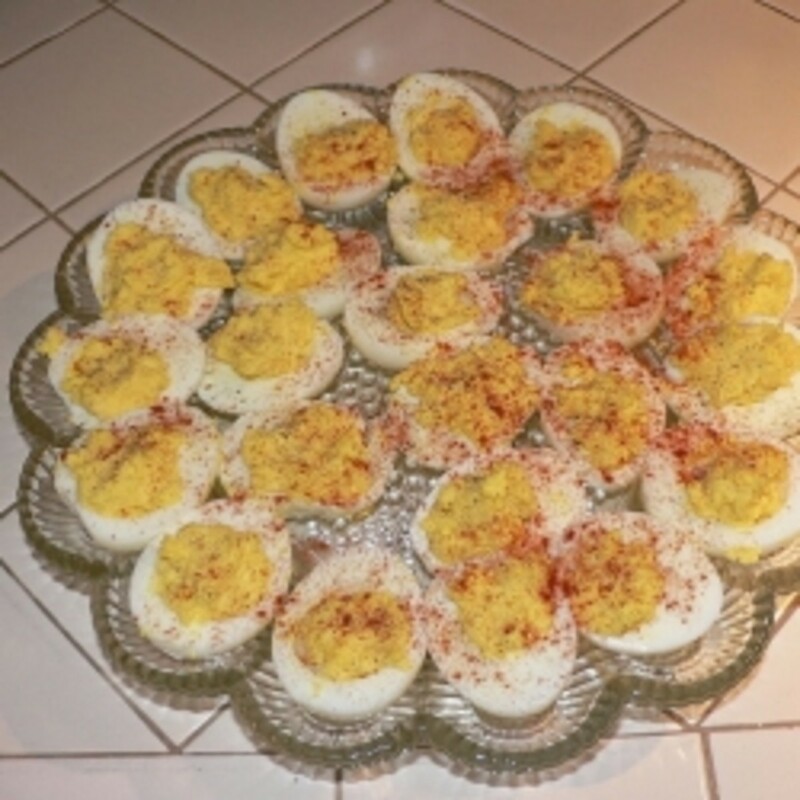 This was a time of great merrymaking and feasting. Though she is widely read and well educated, Tasha's schooling was not of the usual sort. She didn’t begin school until she was seven years old and never finished past the eighth grade. Her early education was spent at a school taught by a man she called Uncle Henry. School was only from 9 until noon and the rest of her time was free. But as she grew older, she was sent to a nearby boarding school and given a more formal education. Tasha didn’t do well with formal schooling, and hated every minute of it. She was thankful that she only had to endure a few years until she was through with academics. Around the age of 15, Tasha began spending winters in Bermuda with her mother, where two aunts lived and offered them a place to stay. Tasha didn’t really care for Bermuda, but longed to get back to the Redding farm. As she grew older, her love for farming was growing. 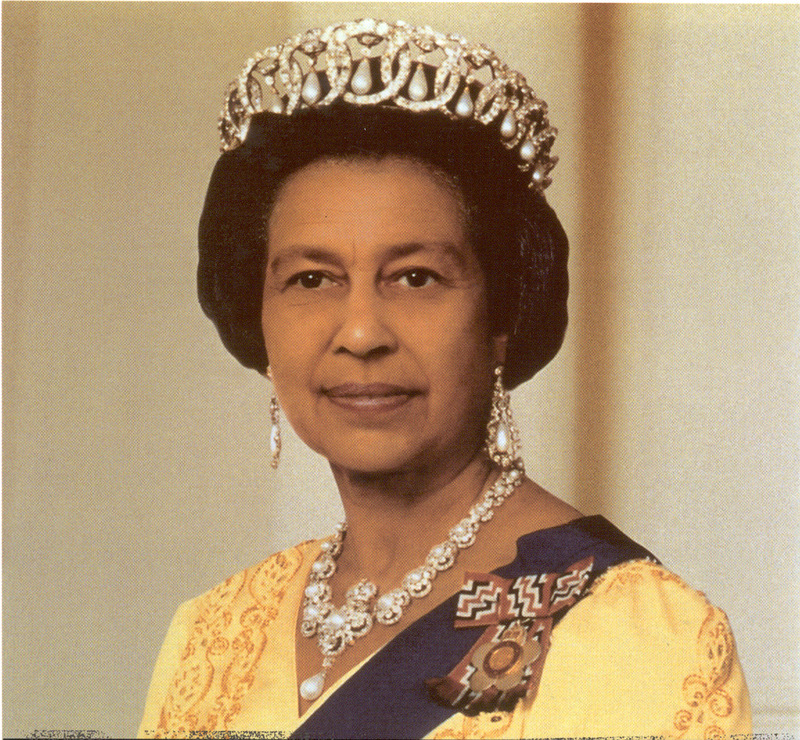 Her teen years were spent on a farm with her mother in Redding, Connecticut in the summers, while wintering in Bermuda. It was here that her love of a farm life flourished. She also spent most of her summers drawing and painting wildflowers and the lovely countryside. As stated before, from the time she was a little girl, Tasha new she wanted to be an illustrator. And, though she wasn't fond of writing, she began writing little stories for children so she would have something to illustrate. At the age of nineteen, she wrote and illustrated a complete almanac storybook, carrying the reader through the life of Hitty Fillow, a young girl who lived on a farm. While this book was never published, it gave Tasha the encouragement to pursue her dream of becoming an illustrator. In 1936, Tasha met Thomas Leighton McCready, Jr. Though he spent much of his life living in a New York suburb, he now lived in Redding, also. But, while he liked the country, he enjoyed city life more. They fell in love and were married in 1938 at her mother’s house. Tasha felt that she could turn Thomas into a farmer and in order to please his new bride he attempted that way of life once they were married. They lived and farmed her mother’s farm for quite a few years while her mother was away painting in Guatemala. They had cows, geese, ducks, and a flock of hens. Thomas ran a milk route, selling cream, milk, butter, and eggs to nearby people. Tasha got up early to milk the cows by hand and take care of all the household chores, including tending a huge garden. This she did without the conveniences of running water or electricity. It was also in 1938 that Tasha had her first book published. Pumpkin Moonshine was originally written as a Christmas present for her niece and after it was published it was a great success. The publishing of this book set the stage for others that Tasha would write and illustrate in the ensuing 60 plus years. Like her mother, Tasha used the name Tudor as her professional name. 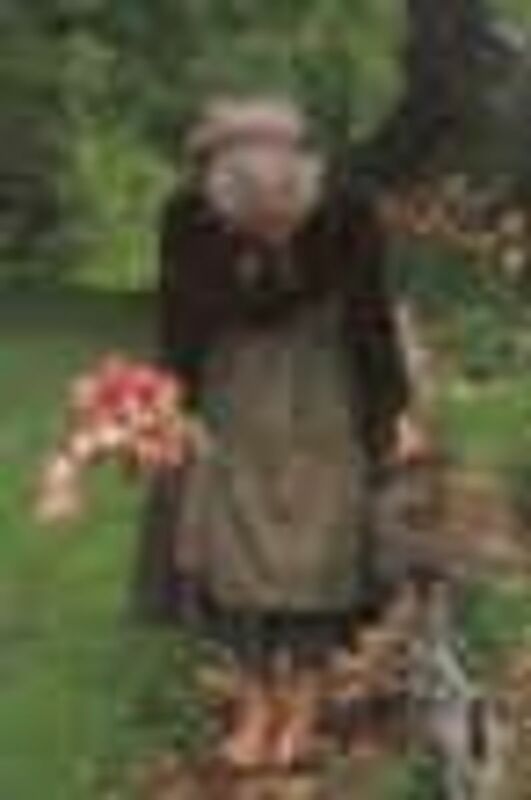 She eventually had her name legally changed to Tasha Tudor. As the young couple began a family, Connecticut did not seem rural enough for Tasha. She had always wanted to live in Vermont. Thomas, however, felt Vermont was far too remote, so when it came time for the McCready’s to move, they settled for a place in New Hampshire. They found an old farm that had been sadly neglected, and over the years, Tasha brought it back to life. While there was no running water and electricity on the farm until the youngest was five years old, it was here that she raised her four children, Seth, Bethany, Efner, and Thomas. Tasha seemed to thrive on difficulty and hard work. Besides her regular household chores, Tasha also wove her own cloth on a loom and made her children’s clothes. Because of her love for this kind of labor, this country life suited her well. Thomas, however, did not fair well in this environment. So, like her parents, the couple eventually divorced, leaving Tasha to raise her family as a single parent. In this role, she worked with even more determination to make a living for her family, and the sales of her books gave the family financial support. Tasha loved illustrating and especially loved illustrating fairy tales, nursery rhymes, and stories concerning holiday celebrations and farm life. Her style of illustration has frequently been characterized as Victorian and nineteenth century. While her children were young, her family learned to entertain themselves by reading aloud for hours from classical literature, going on long walks along the countryside, and developing various hobbies. Being homeschooled, they developed a wide range of skills which included carpentry, writing, sewing, and cooking. From an early age, they learned to help Tasha in running the household, which relieved some of the stress of living without modern conveniences. Her children also added to the family income by constructing marionettes, writing scripts, building scenery, and performing marionette shows with the help of their mother. Once her family was grown, Tasha decided that the large farmhouse was too large and empty for her to live happily in. So in 1971, Tasha sold her house in New Hampshire, and decided to fulfill her dream of living in Vermont. Her son Seth had already moved to Vermont, and Tasha decided to try to find land near him. With her usual good fortune, the first day she went looking for land in Vermont, Tasha found a nice-sized piece of property for sale adjoining Seth’s property. It was just what she was looking for and Seth built the house and barns according to her plans. She went on to landscape the property just as she had envisioned as a child with gardens, orchards, and a lovely deep woods. Almost 30 years have past since Tasha moved to Vermont, and the buildings have aged sufficiently to trick any visitor into feeling as if they’ve crossed the boundaries of time, back to the 19th century. You see, Tasha has chosen to live as one in the 1830’s. 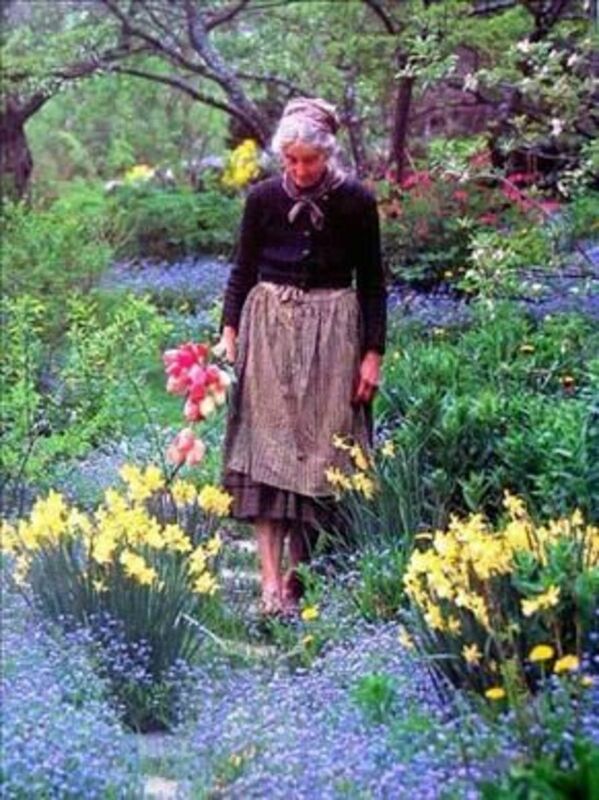 It is here, living in surroundings she had always wanted, that Tasha continues to work from dawn to dusk, milking her goats, making her own cheese and butter, spinning and weaving cloth from her own flax, painting, and above all else, working in her beloved gardens. Tasha has no regrets in life. She doesn’t spend time thinking of past mistakes, but lives her life in the present, enjoying the life she’s made for herself, living out her dreams. 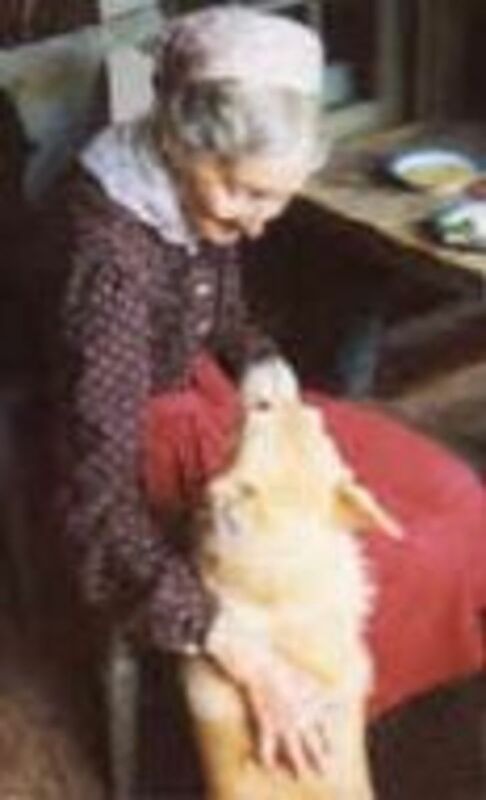 Tasha Tudor Dies at Home in Vermont, at the Age of 92, on Wednesday-June 18. Check out the website below! From there you can click on news and go to a memorial website. 1. Tasha has made her dreams come true ~ A life in a rural setting with all her animals and gardens ~ Much like her illustrations! 2.Tasha is an accomplished author and illustrator. 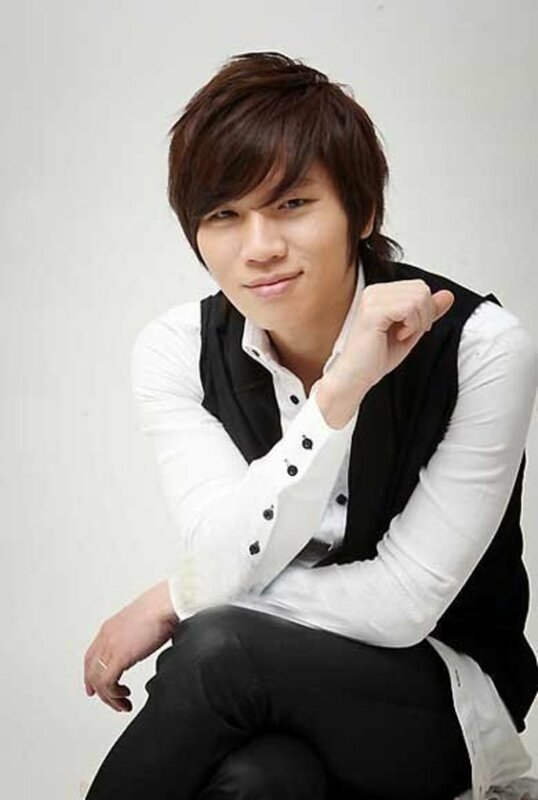 3.Tasha has passed on her talent to her children and shared it with the world. Great reading about her life and accomplishments! Read about Tasha's beautiful gardens and learn her garden secrets, like her manure tea for her gorgeous flowers! Beautiful, color photos. 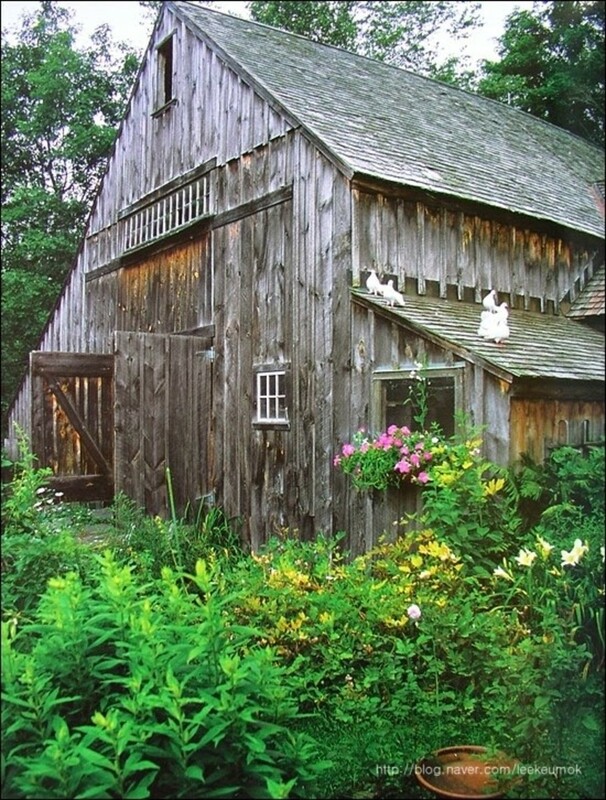 The noted children's-book author and illustrator Tasha Tudor, "half naturalist, half gardener," lives with her dogs, Nubian goats and countless trees, plants and flowers on a 250-acre hilltop farm in Vermont. Here Martin (The Essence of Paradise) and Brown (The Private World of Tasha Tudor) politely dog her trail during the growing months to learn the hows and whys of her gardening prowess. A few knacks and secrets: one of Tudor's particularly prized theme gardens on the property is "hemmed in by a ring of tall lilacs, which artfully disguise an electric fence to keep the deer at bay." Another: "The primroses sink their toes only into well-composted goat manure mixed with leaf mold." Perhaps the ultimate: Tudor's "manure tea," an invention consisting of cow flops and water steeped all summer in a caldron for use as fertilizer. Tea or no, the book's roundly picturesque and dappled with full-color photos of Herself minding the peonies and strolling barefoot (by preference) past the daffodils. The text by Martin is friendly and informative. A list of Tudor's favorite nurseries is included. Quick, what do you think of Tasha Tudor? Tasha Tudor is my hero! I didn't know much about Tasha Tudor but now I do. Tasha in her usual attire when at home: long prairie dress and pinafore. Victoria magazine is a delightful magazine with lots of pictures and articles about the Victorian way of life. They have featured Tasha Tudar and her lifestyle many times, which is how I first found out about her. There are fashion pictures and articles,gardening,recipes,home decorating, English cottage living and my favorite: women starting their own businesses! My sister first introduced me to Tasha Tudor. I have really enjoyed her works and admire her lifestyle. She was one of a kind. I also have a unique first name that I relate to Natasha or Tasha. My first name given to me by my mother but was my Grandmother's is Nawasa. My grandmother's father a Dr. was reading a book about an Indian Princess named Nawasa at the time of my grandmother's birth and loved the name so he named his daughter after her. I have several of Tasha's books and would love to visit her farm someday. I'm working on a lens about A Is for Annabelle. I'll link to this one. Great information. WOW--What a great list of resources! 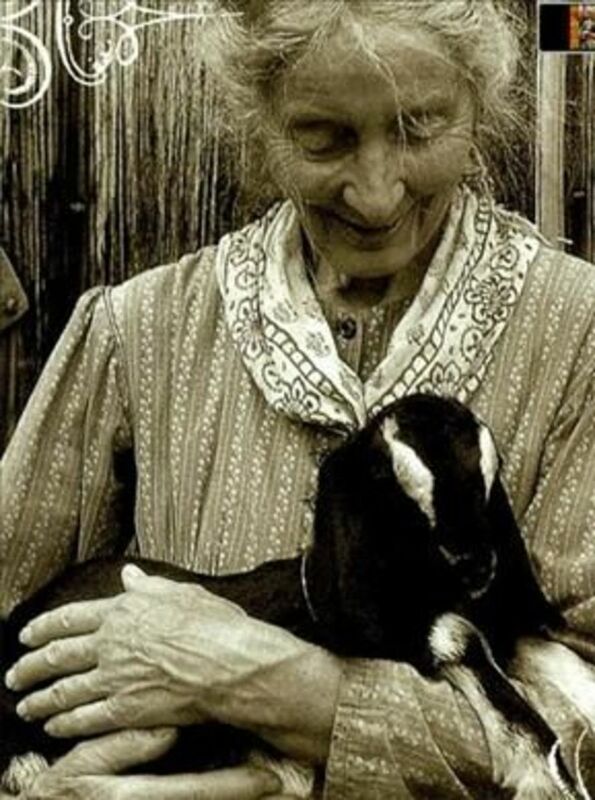 I love Tasha Tudor, especially her philosophy on how to live life. Thanks for joining the Vermont Lovers Group. Your lens makes a wonderful contribution to the group. This lens is a wonderful tribute to a unique woman who was a Vermont lover. So, I would like to invite you to join the Vermont Lovers Group. 5*'s. I've always wanted to live like her...except I don't think I have the ambition to do all she does! I love her gardens and home and of course her drawings! She writes as a true down-to-earth New Englander which I enjoy. Very nice lens! Excellent Lens. I like the quality insight you have provided here about Who Is Tasha Tudor. Keep up the good work. So, do I understand correctly that Tasha Tudor just recently died? You know, I honestly had never heard of her until I found your lens. A great tribute indeed. Wonderful lady, wonderful lens. 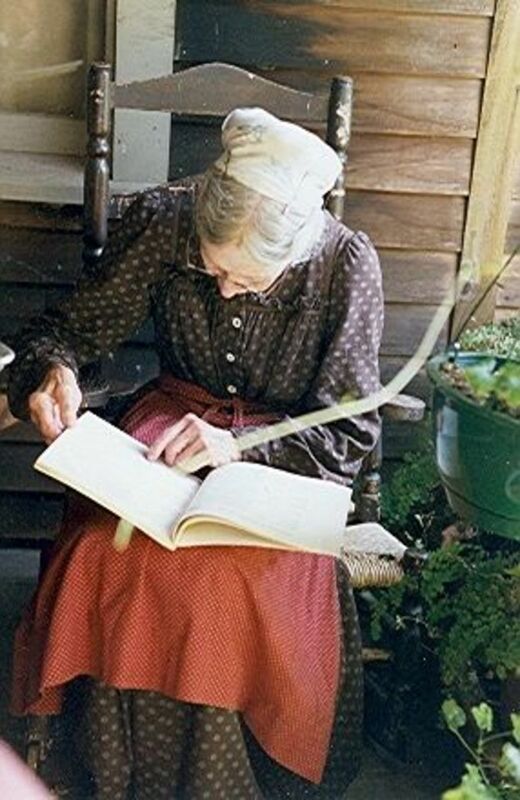 Tasha Tudor's Graden is a favorite book, and I'm glad to know more about her. Definitely a heroine to me. 5 stars!! A Fairy Tale Wolf was checking out your lens and liked it so well that he is sending you a virtual cup of coffee to hang on your wall. I will check it out.Evelyn. Wonderful story about an amazing lady! I love her spirit and style. She's a role model we should be proud to emulate. Your writing style compels one to read more. Nicely done...again! I first heard about Tasha Tudor from a librarian at the Cambridge Library. I love her illustrations. Garner Rix lived about that time though the lens on him focuses on 1780. I just thought you might like to check out my new lens http://www.squidoo.com/1780 about Garner Rix and the Royalton Raid.